Designed for HD video capture and burst shooting, this memory card marries fast data transfer rates with capacious storage. Its 133x transfer rate equates to a read speed of 20MB/s, while the Class 10 designation ensures that, like the Samsung 16GB SDHC Plus Class 10, write speeds are sustained at a minimum 10MB/s. 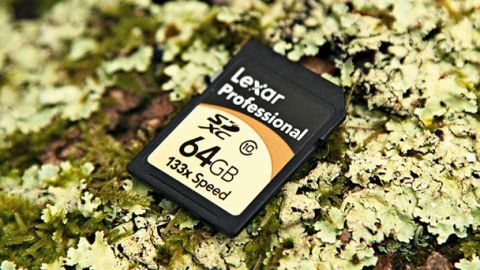 The Lexar Professional 133x SDXC's 64GB storage capacity, meanwhile, is said to be sufficient for up to 24 hours of Full HD 1080p video footage, although this will vary depending on the method of compression used by the camera. The card comes complete with download instructions and an activation code for Lexar's Image Rescue 4 software, which works with both images and video files, and is compatible with other memory cards such as the older SD formats and CompactFlash media. Free technical support and a limited lifetime warranty is also included as standard. When transferring data from the card, it couldn't quite manage the promised 20MB/s rate - instead peaking at just over 17MB/s - although transfer speeds do depend on both the card and the device in which it's used. The same test conducted with a similarly specified Class 10 SDXC card showed the Lexar to be around 10% faster, although the rival card can be found for around 30% less. Write speeds were also consistently higher than the rival card, by a margin of around 15-25%. Overall, the Lexar Professional 133x SDXC 64GB is a good choice as a £100-ish high capacity memory card, and the inclusion of the Image Rescue 4 software is welcome. Those not needing the software, however, should know that cheaper alternatives - such as the Integral UltimaPro SDXC and Samsung SDHC Plus Class 10 - are also available.